Call 402-554-1925 to book by phone during normal business hours. Rent a huge inflatable for your event! How would you like to blow away the guests to your next party at home with a huge inflatable at your next event! We have bouncers for little kids, obstacle courses for little kids, double slides for all ages, and even a huge obstacle course that is great for kids, teens or adults! Rental is for a 24 hour period. Pricing discounts available for additional days or if you rent multiple inflatables. We will even deliver it to your door and take it back for no additional charge! (within Omaha metro area) Read below for inflatable selection and availability. $200/day Nice small bounce house. Handles 3-4 kids at a time. Best for ages 3-7. Requires power for one (1) 15amp blower. 25'x30' floor space. If you are looking for more consider upgrading to the full train obstacle course listed below. $400/day Medium sized kids obstacle course. Has 3 sections: bouncer entrance, rock-climb and slide, and obstacles. Handles 4-6 kids at a time. Best for ages 3-9. Requires power for three (3) 15amp blowers. 25'x60' floor space. $300/day Cool 2 person rock climb and 15 foot slide. Players can race each other up and see who is fastest to the end of the slide. Handles 2 people at a time. Best for ages 6-adult. Requires power for two (2) 15amp blowers. 25'x30' floor space. If you are looking for more consider upgrading to the full monster truck obstacle course listed below. 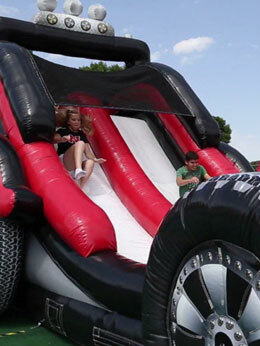 $750/day Awesome ONE HUNDRED FOOT LONG obstacle course for 2 people to race at a time. Includes 3 major sections: initial rock-climb and slide, obstacles and mini rock climb and slide, final large rock climb and large slide. Handles 2-4 people at a time. Best for ages 6-adult. Requires power for six (6) 15amp blowers. 25'x100' floor space. Please note that all inflatables will require: power on site (blowers include 20 foot cords, you must provide additional extension cords if necessary), flat smooth surface (clear of rocks, debris and sharp objects). Delivery vehicle must be able to drive a minimum of 100 feet within the inflatables' location.